As the first independent British theater company to stage at the Beijing Fringe Festival in its four-year history, Lumenis Theatre company brought a double bill of two of its London-tested plays, "Magical Chairs," written by Lumenis co-founder Mary Mazzilli and "There's Only One Wayne Lee," adapted from the play by renowned English playwright Roy Williams. Mazzilli's "Magical Chairs," a half-hour long short play, is a largely-improvisational abstract piece widely left open to audience interpretation. Two boys (Chris Chan and Alexandre Ross) interact in a closed world consisting only of plain chairs and a dummy human as props. Both boys are enthralled with magic and dream of being great magicians, but confront their actual plebian existence from very different perspectives. Ross' character seems more the realist, with Chan more the romantic. The stripped-down piece challenged the audience to think beyond the parameters of a normal storyline and plunge into the surreal murk of isolation and raw emotion. "There's Only One Wayne Lee" is a new adaptation of Roy Williams' play "There's Only One Wayne Matthews" first produced in 2007. The original Williams script revolves around the relationship of two African-Caribbean teenage boys growing up in East London in the 1970s. Director Jonathan Man's adaptation changes Wayne's last name to "Lee," centering the play on the dynamics between an African-Caribbean and a Chinese (Chris Chan and Alexandre Ross). The play centers around the unlikely friendship between main characters Wayne (Chan), the bookish son of a Chinese immigrant, and Carl (Ross), the Caribbean-African school football captain. In this piece, the two-man cast of Chan and Ross also play dozens of different supporting roles that enrich the main storyline. Carl teaches Wayne how to play football and be confident about himself, while Wayne teaches Carl not to be afraid to stand up against racial persecution. In this straightforward but endearing play, the Beijing audience seemed to identify well with the imagery of English football culture and the almost instinctive interplay between Chan and Ross, despite the complicated (and sub-captioned) dialogue. According to Lumenis producer David Albrecht, last Saturday's Beijing productions of the shows were the second half of the company's "London-Beijing Connections" series. 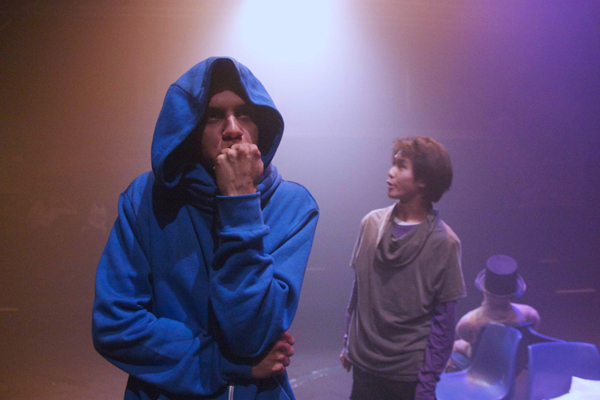 "Magical Chairs" and "Wayne Lee" debuted at London's Southwark Playhouse in August 2011 to much acclaim from the British press, especially from the city's Chinese-language media. About 30 percent of attendees at the London debut were Chinese, highly unusual for a fringe theater production, Albrecht said. Albrecht said he felt that Lumenis could serve as ambassadors for the British fringe theater scene to Chinese audiences. "I think Chinese audiences are absolutely interested in seeing plays from abroad," Albrecht said. "Our main challenge is seeing how the Chinese can adapt to wordier plays." After receiving grants from the Arts Council of England and the British Council, Lumenis won a spot to participate in the Beijing Fringe Festival. Albrecht said the company's idea of melding the cultures of the UK and China was a critical factor in receiving the funds for the production. Negotiations are in the works to expand the "London-Beijing Connections" double bill to other cities in China next year, Albrecht said. The festival will end on Sunday Sept. 25, with a dozen or so performances remaining on the schedule in the next few days. For a list of performances and to buy tickets, visit beijingff.com.